When do you need to reset Chromecast (factory data reset)? Most of the time, it is not necessary to factory reset Chromecast (factory data reset). The device update itself when connected to internet. It seldom gives problem. You change your wireless router. Chromecast can only remember one network. If you changed your router, you can either re-do the setup (you may follow this Chromecast setup guide) if the old network is not in range, or simply reset Chromecast. Chromecast hangs or freezes. You can try to plug out the USB power cable, then check whether Chromecast works after plugging the cable back. But if this doe not work or Chromecast hangs frequently, it is good idea to reset Chromecast (factory data reset) before calling Google support or returning the unit. It is quite simple to factory reset Chromecast. There are two ways to factory reset Chromecast. Hold down the button (next to the micro USB port) on your Chromecast for at least 25 seconds or until the solid light begins flashing. Then disconnect the USB power cable. Wait a few seconds. Connect the USB cable again. This will factory reset Chromecast (factory data reset). Because there is only one button on Chromecast, you surely will not miss it. This method is only applicable when you still can connect to Chromecast from your device (e.g., an Android phone or tablet). Sometimes, if Chromecast simply freezes and you cannot connect to it from your device, you then have to use method 1 mentioned above to reset Chromecast. 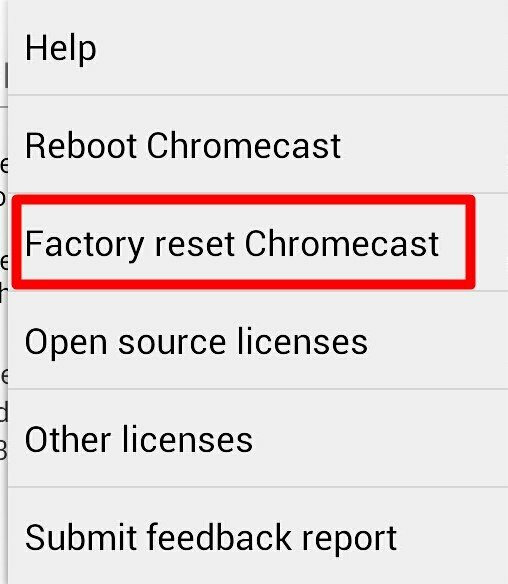 You can tap “Factory reset Chromecast ” to reset Chromecast. (Occasionally, you can also reboot Chromecast by tapping “Reboot Chromecast”). Once you reset Chromecast, all your old network settings will be wiped out. You need connect to the wireless router again following the Chromecast manual. Can you reset Chromecast now? If you have any questions or get any problems in resetting Chromecast, please let us know if eh comment box below. More Chromecast tutorials, tips and tricks can be find in our Chromecast How-to Guide page. When connecting my chromecast on any given day, it gave an error screen, and was no longer being recognized by the phone. I tried to reboot with the idicações up and failed. it does not restart and did not blink evenly. it is only with the white light on, not for trading any other color. did you try to reset it with method 1? Please note, you need press and hold the button for about 25 seconds until the solid light begins flashing. After this, you need disconnect the usb cable from the power adapter for a few seconds (a lot of people fail to do this). Then, connect to the USB power adapter. You can then setup Chromecast again. Hello, I tried the reset by method 1 did not work. The LED is directly connected with the white light. You probably did not hold the button not long enough (about 25 seconds), or too long. When the light flashing, you need release the button and disconnect the USB cable (power). I have the same problem. I tried hold the button but the chromecast is freeze yet. What can I do different to solve this problem? This is the only (official) way to do a factory reset. You just do it again. It seldom fails if you hold long enough. You can see how the light change when holding the button. You may try to disconnect the power, reconnect it, then press and hold the button. I had just chance my modem, what can i do? You need make sure 2.4GHz band in your router is on. Most new routers have dual bands. Chromecast can only connect to 2.4g. Sometimes, rebooting the router may help. that is helpful regarding the 2.4 ghz limitation. No wonder Chromecast can’t “see” my 5GHz network! mine is not blinking at all. It was working fine. Now its not turning on. I tried pressing for a min. taking out, doing a power recycle too by pressing button, but it seems nothing worked for me. Any suggestions please? You may try another USB power cable /adapter. If it cannot power up, it is very likely a hardware issue. The light never blinks. We held it for over 24 seconds. We can’t reset Chromecast from our devices, because they cannot locate the Chromecast. Since we are trying the reset process via holding down the button on the device at least 24 seconds and the light never starts blinking, it appears we have no way to reset the device. It is useless to us at this point. HELP Please! You need connect the device to the USB adapter. What’s the color of the led? The device was connected to the USB adapter when we held the button down at least 24 seconds. The led color is red. After you release the button, is it still red? or changed to white? Did you try another power adapter with 1000mA or higher current? Occasionally, insufficient current may give this behavior. If you are now connect the USB cable to TV’s USB port, you may try the bundled power adapter. If you are already using the bundled one, you may try some mobile phone or tablet chargers with 1000mA or more current output. After changing the USB power source, please wait one or two minutes. If the led is always red, try to reset again. I am having the same issue and have followed the same steps. I have tried physical reset multiple times. I have changed location, connect to different machines, reset my router. Still the little red light mocks me as I run low on rented time for my movie. What’s the output current of the chargers? Also what’s shown on TV if you don’t press the button? 1A current should be sufficient. You may try another USB cable. If the led is still red after a few mins, probably the dongle was damaged. We went ahead and exchanged this chromecast for a new one today. We’ll keep this in mind if we run into this problem again. Thanks for trying! First, can your device find your Chromecast? If you changed your wireless router, you need reset your Chromecast (and set it up again). What’s shown on the TV? Tried reset, the led went white, but from my ipad, it won’t recognize a chromecast at all, everytime I launch the app, it wants to find it, because it can’t find it, I don’t have the menu option either. I don’t have another USB to match this cord. 1. What’s shown on the TV screen? 2.your iPad must connect to the local router. The charging cable is USB… That’s what it has to do with USB. Setup link is for you to download setup program (for pc) or apps (for mobile). Would you please follow the setup steps and let’s see how it goes? I also have a problem trying to find device from my asus tablet using chromecast app. Also have galaxy s5 and that finds device and casts without any problems. Have tried rebooting router and factory resetting chromecast but my tablet still cannot find device using chromecast app. What’s the model of the tablet? You may try to check whether there are any update for the tablet and Google play. Did you update the Google play store? Still chromecast app does not find device. What is your mobile device? That method of reseting Chromecast requires a connected device and Chromecast app. I tried to reset with option 1, but it doesn’t work.. I hold the botton for 25 seconds.. when there is a white blink i disconnect the adapter for a few seconds.. but it doesn’t change anything.. when i put the chromecast in my tv, i still get the message tho reconnect with that other network..
You have to try it again. I’ve tried it for a couple times, and it works again. Thanks! Lucky you. I’m fighting with this same problem for weeks. Trying again is all I can do. And no success so far. What’s the color of the LED? Did you try to disconnect the power adapter after holding the button for more than 25 seconds? Did you try to use another power adapter with 1000mA current output? ok, I tried method one, and now the screen says resetting to factory defaults. It has been that way for over 15 minutes. Unplug the power, wait 1 or 2 mins, power the Chromecast again. is it ready for the trashcan ?? The led is red during booting or updating. If nothing shows on the TV fire more than 5 mins, the red colour normally indicates insufficient current from the power supply or some booting problems. If you are not using the “official” power adapter, you need check the power adapter has 1000mA or higher current output. Most new Samsung adapters should provide sufficient current. (The official one is 850mA). If it’s due to booting problem, you can try to reset it as you did. But remember, you need power it (with sufficient power)when reseting. You need hold button for more than 24 seconds (normally you will see the led flashes or changes colour after 24 seconds). Then disconnect the power, wait a min, connect to power again. If the reset really doesn’t work, you probably have no choices except claiming warranty or letting it sleep forever. anyone else having issues getting chromecast to connect to their network? I keep getting the reconnect me message no matter what network I use and even though they’re all working. Did a factory reset too and no dice. Any help? Did you change the network? Chromecast can only save one network info. The TV screen should never be blank before or during casting. Once it is powered, the it should show some photos or messages on the TV. Did you check the TV source? My CC has just been giving me a “Hang one a sec… ‘cast’ needs to reboot to apply an update.” for a couple weeks. I can’t get it to factory reset because none of my devices recognize it, and no matter how many times I try, I can’t get the white light to blink. I unplug it and reconnect and it takes a couple minutes to apply an update – but when the update is applied, I am left with the same “hang on a sec” screen. When the chromcast is on, hold the button for more than 25 seconds and you should see the color changing of the led. Then unplug the power, wait 1 or 2 mins. Plug the power again. Chromecast worked 2 times out of the box…… What a waist of money…… Guess I’m going to have to get another Apple tv. Apple TV 2, chromecast garbage. The chromecast app is saying that the chromecast has been configured correctly however it can’t connection to my ipad. I know that the two devises are on the same wi-fi network so I don’t understand what the problem is. How did you finish the setup?from which device? if you can finish the initial setup, it usually means Chromecast has no issues with the router. Did you check Chromecast app in your iPad? Thank you for your reply. I must admit I am a bit of novice at this. I finished the setup from my ipad. On the tv screen I got the message that the chromecast was succesfully installed and ready to cast. However on the chromecast app I was told that the chromecast and ipad couldn’t communicate. I am certain that they are both connected to the same wi-fi network. I don’t know if it something in my settings. There are no settings for chromecast except initial setup. You may try from pcs or other mobile devices to see whether the device can be found. if the Chromecast app does not work, you may try to clear cache and clear data for the app. you need reset chromecast only if you change the router. If you just change ISP, but not the router, it is not necessary to change anything. I still think the problem is associated with your phone because the app fails to run. It is probably not related the Chromecast device. You may try to update all apps (not just Chromecast app) in Play store. If you cannot get assistance from Sony. You may backup your data and then perform a factory reset. What’s the led color in Chromecast? Please try the bundled power adapter if you were using the USB port on the TV. No color… i try pushing the factory reset but i get no light up no matter how long i hold it down. When its plugged into the wall it consistently blinks white. Is it normal to keep blinking when plugged into the wall? No, it is not normal. It should start with read, end with white. Please use the power adapter provided to power Chromecast, NOT the usb port on TV or adapters. It sounds like the Chromecast is not powered properly. Anything on TV? No signal? Hi Simon I am having a problem and was wondering if you could help me. I have replaced my router and TV and haven’t used the chromecast in a few months. When I plug it into the TV it shows the “Chromecast…” screen for about 2 seconds then goes black and repeats this. The light is red most of the time but changes to white for a second. I have tried all the ways of resetting I could find like holding the reset 25 seconds and unplugging the power. After messing with it for a while I gave up and had the chromecast plugged into the power but not into the TV. When I was messing around on my ipad I noticed it had my old TV name in wifi. I joined it, ran the setup and it started fine. When I got to the part where it connects to my router it always fails and starts the process over. Can you give me any suggestions on what I might try next? It seems the reset is not successful. When you hold the button, you should wait until the led color changing from white to red. This should be around 25 seconds. After the color changes, you can disconnect the power, wait a min, then connect power again. You may also try a different power adapter. Most smartphone chargers with 1000mA or above current should work. You cannot finish the setup without getting the code shown on the TV. Chromecast should be independent of TV. There is no TV info saved in Chromecast. The only info saved during the setup is the network info. What’s the message on the TV? I don’t think there are any other ways to reset Chromecast. You just keep pressing the button for more than 25 seconds. For firmware, probably there is no easy way to install it manually. Did you finish the setup? Simon it was easy to find the right way. I thought I could do it over safari but I learnt that I had to have youtube app. Well I’m still a little sad, why cannot I watch my own videos with chromecast? You need finish the setup with your smartphone or pcs. After the setup, in the smartphones, you need install Chromecast app. To watch YouTube videos on iPhone, you need YouTube app (not through browsers). On some Android phones, you can directly mirror your screen and audio to TV. On PC, you need Chrome browser, and Google cast extension. Then, you can casting from PC. I have a problem with my chromecast. I plug it to my TV and …. nothing . I have selected the right hdmi port and the light of the chromecast is white. I have a Siligeance routeur , is that compatible with chromecast. What’s shown on TV? If nothing, you very likely chose the wrong hdmi source or you didn’t insert the device tightly. You may try another hdmi port. Got Chromecast all set up. Said ready to cast. Then said it was getting updates. 2hrs later it’s still getting updates. Should I reset again? You can just unplug the power. Wait a few minutes and then plug back. If it is stuck at getting updates, probably the flash memory is defective. Suggesting to reset is so obvious, everyone tries this before calling for help. Waiting a few minutes, hour or even days does not solve it. If I manage to turn off the Wi-Fi I can set a new network, but after restarting the device keeps looking for the old network. For me this clearly shows a defective memory that cannot be written. I tried to reset and hard reset a lot of times in the last 3 or 4 months, all the time the device is updating, restarting and updating again, in loop. This only reminds me to not buy another Google device in life. If it’s stuck in update, you can always unplug the power cable. Then try again. If it still asks for old network after reset, it simply means the reset is not done probably. You need wait till the led color changes from white to red. This takes about 25 seconds when holding the button. There is a third reason to do a factory reset thats not listed. I baught one yesterday and will be returning it tomarow. I don’t want my info left on it. It’s not broken so it can be resold by walmart but they told me rong @ best buy. At bestbuy they told me it worked exactly like a samsung AllShare cast dongle. It does not. It will not allow me to screen mirror my galaxy s3. It also doesn’t have a amazon app. The whole reason I wanted it was because my blue ray player doesn’t work with anszon instant videos but my fone does. Since it doesn’t work for what I baught it to do I will be returning it. That would be the third reason to reset it to factory defaults. There is only one button near the USB port. it keeps telling me to enter a password.. i don’t even remember setting up a password.. When and where does it ask you to enter password? You may give more details. i just exchanged it .. I review the ap isolation, change of ap (I have 2 Ap and 1 routed with the ap disabled) but can’t connect neither of the cases. I’m connecting the power with the original power supply and also try connecting the hdmi extender. The blank screen after Google/Chrome logo probably has nothing to do with the network. It’s usually indicates some problems in the display output from the Chromecast device. You probably can try to unplug the power cable for Chromecast. Then try again. If the problem persists, you may try to reset the device. Btw, never try to manually connect to the ap of ChromecastXXXX,which is for the setup program and chromecast app. Hello, I tried to reset but it always stays white blinking and black screen, also I try to connect in 6 different TV models and always see only the Google logo spinning and then black screen. You may try the USB adapter in the box, if you are not using it now. You can try to press and hold the button for more than 25 seconds to reset the device. Unless the device is damaged, it should respond to the button. After 2 months of usage, my chromecast os stuck on the update loop. In this mode, I can’t connect it with any of my devices (nexus 5, nexus 7 and PC). Tried several times to hold down the button for 25 seconds or more, and it didn’t work. Also tried to disconnect the router and do the reset later, but it always remembers my network. Chromecast should respond to the button. You may unplug the USB cable, wait a few mins, plug it back. Now try to press and hold the button for around 25 seconds (pay attention to the led color change). Worked for 2 days and now it says reconnect me..im not able to get wifi on my kids tablets or laptop. Chromecast should never change your router settings. Would you please give more details of the problem? For example, what do you want to do? What’s spam on the TV screen and on the tablet? It is probably due to the wireless channel. Chromecast can only use 2.4g network. So, you may check the current channel of your 2.4g network. You may try to manually set the channel to 6 or 11 (default should be auto) . If your router has both 2.4g and 5g networks, you should use different network names for them. Hi. I thought that I had successfully set-up my Chromecast about a week ago, but now when I go to use it, it’s not being recognized by the TV – as in, it’s plugged into the HDMI port and the outlet, but my TV (I’ve tried more than one) still reads “No Signal” as if nothing is connected. Therefore, I tried to set it to Factory Re-Set (since nothing is registering on the computer, I’m left to the manual option). But the light is unchanging for me. It’s white and remains white – no blinking or color change. Do you have any suggestions to assist? Also – do you know if Google have a live chat feature for these issues? I think you can only contact Google though a contact form. If the TV shows no signal on more than one TVs, it probably means the device is damaged. Anyway, you may try to use the HDMI extender and another power adapted. Has anyone had the same problem or has any idea about how to solve it? Unfortunately, you cannot block the update for Chromecast. But normally, after update it should not loop the process again. It should ask you to go though the setup again after factory data reset. Did you try a different HDMI port? If the LED color is red, it usually means insuffucient power input. It can be caused by faulty cable, faulty or under-powered power adapter or loose connection. In the middle of a show CC stopped working. My apps show it as connected but nothing will cast. I’ve rebooted, factory reset, unplugged, restarted phone, even called my geek brother. Please help! After factory data reset (FDR), what’s shown on TV screen? Ready to cast!! It shows being connected to my WiFi, my phone recognizes the CC and lets it “connect” but the picture on my TV is still just the Chromecast backdrop. In your phone, open Chromecast app. Once the Chromecast device is found, tap the gear icon for the Chromecast device, then close it. Now, try again. Chromecast no longer reboots after update. I can factory reset and the update loads 0%..100%. Then the stick reboots and says 10%…20%… failed_reboot. Sometimes it starts and shows pictures, but shortly it tries to update again. Can it be that there are HW revisions of it and the new update is simply not supporting my stick. No, as I know the firmware should work on all Chromecast devices. Probably your Chromecast is at the end of life if factory reset cannot solve the issue. But before you throw it away, you may try a different power adapter. Occasionally the unstable current output can cause the problem. Most phone chargers with 1000mA or higher output should be OK.
does Chromecast find your wifi network? You need set up the Chromecast as a new device after resetting Chromecast. Yes it finds my WiFi network. When I put my password in and hit connect it won’t do so. What’s the error message? Does your router have any special settings, for example, Mac address filter? I have no idea, about the router. O wouldn’t even know how to check. What’s the message you got after submitting WiFi password? Not sure. But how is your network configuration? If you cannot finish the initial setup, you cannot not use Chromecast. My samsung chromecast get locked. How can I reset it, I had tried many methods but the setup is not completing saying your device is not dev mode. Plz suggest any other method to do factory reset or password breaker tool. Did you follow the guide and holding the only button in Chromecast? It has nothing to do with your Samsung devices. You can set it with any supported phone, tablet and PC. I’ve done everything you’ve recommended in this hugely long message post, and all I get is a blinking WHITE light. I can’t find the device, can’t launch the app because there’s no device, the TV doesn’t see it (and I’ve checked both HDMI ports for operability) and plugged it both into the outlet and into my computer (tower). I’ve reset it about a hundred times, it goes through the phases you talk about, then it settles into a white, blinking light and I can’t find it. We do have a new router, so I’m assuming we’d have to factory reset the damn thing anyway, but either it’s not resetting properly (even though I have all the lights in proper sequence), or something else is wrong. What does a continuously blinking WHITE light mean??? I think The wifi ON The chromecast is fried. I’ve tried Factory reset, but when I try to Choose The Chromecastxxxx wifi hotspot I get an error Message, says it can’t connect. Now what? Buy a new one? You should only connect to Chromecast through Google cast app during setup. You should not directly connect to Chromecast. What’s shown on the TV screen and what error message did you get when you try to set up Chromecast? I have changed my router which rendered my Chrome cast useless 🙁 I use my Sony Xperia Z2 mobile phone to cast from. I’ve made a “factory-reset” on the cast device but I have a overlay problem, when I try to search for a device I get an error message that says I have to turn off an app overlay, I’ve turned them all off (even system apps) but I still get the same message. Getting quite frustrated.. What am I to do? Did you try to reboot the phone? Also, you may try to update the phone. The overlay issue was fixed in most phones. Anyway, you can set it up from your PC or other mobile devices. Thank you for sharing the update. Actually, I would not recommend any apps from cheetah mobile. Mt Chromecast has suddenly gone off. No light whatsoever. I tried holding the button on the device for 30 seconds. nothing helped. Not getting vonnected from any source. please help. Did you try another power adapter? Most phone chargers should work. If the LED is off, it usually mean it is not powered (or damaged). Please help me my chromecast cast has no light I can’t see any display on my TV I don’t know what’s wrong with please help. Did you check the power adapter? You can try a new power adapter. Most phone chargers should work. I tried the hard reset but the white led still flashes – have I got a faulty one? What’s shown in TV screen? Pulsing orange means it is not ready. Pulsing white means it is not connected. It should not show two colors repeately. Anyway, what’s shown on your TV screen? I’ve reset my chrome cast multiple times but it disconnects at least once a day after each use, and has to be completely reset only to repeat the process. It’s worked fine for months until this. It is very likely due to some router settings. What’s shown on the TV screen when you get the connection issues? One solution you can try is to reserve the IP for Chromecast. When Chromecast is connected to the router, you can find the MAC address and IP address of Chromecast in router settings. You can reserve the IP for the MAC address. I’ve been asked to give a talk (I’m the one with most knowledge) on android usage to a senior centre group. My chromecast does fine here at home, but I’m a bit worried of how to connect to the senior centre wifi? You need to reset the Chromecast and then set it up as a new one. Please note Chromecast does NOT work with open WiFi requiring log in through a webpage. Also, for WiFi access point with AP isolation, Chromecast may not work as well. This can be found in some corporate WiFi networks. To reset Chromecast: as shown in this page (in short: hold the button for 25 seconds when Chromecast is powered and conencted). To set up Chromecast as new: check this page (a bit outdated). In short: you can use Google Home app in Android devices or iPhones to set up Chromecast. Just follow the on-screen instructions. Thanks. I received the Chromecast to help others & now is the first time to change the set-up. Google actually made the setup very simple. Inside the Google Home app, you just need to follow the on screen guides. Anyway, if you get any errors or are not sure, you can post the question so that others can help you. Screen always says “reconnect me.connected bu cant access internet” what should i do.please help me. It means the router which your Chromecast is connecting to does not not have internet access. Please note, Chromecast requires internet connection even you use it for local contents. Mi Chromecast has a always orange lights and I cannot do the factory reset by button.I cannot see it on Google home and there is a black screen on TV. Please, anybody help me? It is very likely due to insufficient power of the power adapter. Are you using the original adapter? Yes I used the original and I also tried other power supply. Other troubleshoot ? if nothing shows on TV screen and the light is orange, then the problem is usually related to power supply. Did you try some USB chargers with 2A output? If there are some hardware issues inside the Chromecast, then you have to return it (if it is still under warranty, which depends on your region) or throw it away. Yes, I’m using a iPad usb power supply (2.4 A). I’ll contact to return it. I ve tried factory resetting my chrome cast.but its still giving the flashing orange light as it was doing before resetting. The tv screen is black.this happened just suddely. Are you using the original power adapter? You can try other USB chargers with 1.5A or 2A output. THANK YOU! I´ve been going around the internet and back again to find information on how to change the network on my chromecast without having access to the old Wi-Fi, so thank you for spelling it out and writing down this easy-to-do approach! i have 2 chromecast. untill the oder day everything was jus perfect. today none of them works. Other info on the screen? What’s exactly the message? Did you try to power off, then power on it? i ve tried everything. rebooting all my devices, factory data reset for my chromecast…. What’s exactly shown on the TV screen? What’s the color of the LED in Chromecast? the message is: „Chromecast failed to download stream chunk“. How did you get the message? i ve studied all day long this issue. it seems the my chromecast will need another firmeware. buuut the other chromecast that i have is working still perfectly and it has the firmware nr. 1.27.96538.
i dont know why cause i bought them in the same day from same place. please check my infos anf let me know what i shall do. What’s the problem? What’s shown on the TV screen? Hi. As i said … it is the same problem as viorel has ….„Chromecast failed to download the stream chunk“ …. same firmware as his ….. 1.28.100555. I did everything …reset …all new …. etc ….. no work since 1 nov 2017 or before update. All good before …. Any solution except buying a new one or go to apple tv? When/how did you get it? When you tried to cast from certain apps? Or immediately after rebooting the Chromecast? Hi! I reset the Chromecast device and the old network no longer appears on the TV screen, but I fail to be able to detect the ipHone even after plugging it as instructed. It is not detected. It had been working great, but with the new modem (that is new network), it is not working. it seems that chromecast has a problem. it comes out, from what a i understand so far, that chromecast has a problem with sound soft. my applications that are using 5.1 sound will not be able to be cast on chromecast with firmware 1.28.100555. Thank you for sharing the update. So it’s clear the specific Chromecast problem is related to specific apps (stream source). Hopefully, Google will fix it in next public release. Hy , i have the Same problem as those guys Viorel and Vifor my chrome cast stop working with other apps than Netflix HBO YouTube or Google play Movie witch is a big disappointment and I don’t get it why some I read on your disscution this is something that google did with this firmware and I don’t get it. Tomorrow I will throw my Chromecast to garbage and I will get my self a new Apple TV. The product that corresponds to Apple TV is Android TV, not Chromecast. Anyway, it seems the problem is limited to a few streaming services and is linked to the “preview” firmware. I think Google will fix it very soon. Ok Simon. My generation 1 dongle worked with Miscast for 3 1/2 months. I moved had to change networks and it made the new connection when I setup again. 2 weeks ago I got my first Note… “Some questions, Please restart! My indicator light is blue. I used method 1 and held the reset bottom 25, 30, 45seconds, even up to 3 mins. My light didn’t flash or begin blinking. I’ve changed adapters, held the reset button attached and detached from the TV. Still no change. After the first week, I downloaded a second Miscast App and was mirroring once again. When I lost access this time I noticed the IP address wasn’t correct. I reset the router held the reset for 1 min+ still wrong IP setting. Suggestions? Anyway, for Chromecast, you do not any Miracast apps. Did I miss anything? I’m having trouble reconnecting my new wifi network to my chromecast built in. How do I delete old wifi network so I can connect new one.. If your phone is connected to the new network, in the Google Home app on your phone, you call find any nearby Chromecast devices that are not connected to any WiFi network. Then set it up following the guidance. Alternatively, you can reset Chromecast as explained in this guide. Then you can set it up as a new device. We had to change the name of our wifi network, so I did a factory reset. (I deleted the device from the Google Home app– which was probably a mistake in hindsight). After doing method 1, instead of ‘set me up’ screen, I see a “Welcome. Download the Google Home app” screen. But the device cannot be found during set up in the app. Any advice? First make sure WiFi on your phone is turned on. You can then try to clear cache for the Google Home app. In Android phones, in the application manager (usually settings – apps), your can find the Google Home app, then tap the storage, then clear cache. If Chromecast is the only Google Home device you are using, your can also clear data to reset the app.